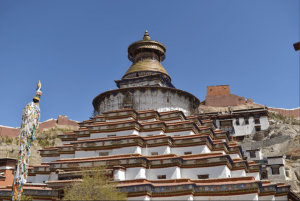 Here is the adventure of a lifetime, visit the Tibetan Plateau and explore the holiest Buddhist sights in Lhasa, Tibet: The Potala Palace, home to the Dalai Lama. This adventure is specially designed for the curious, the adventurous, and takes an interactive look at Tibet: Sip yak butter tea! Visit Jokhang Temple one of the oldest temples in the world, many Buddhist are drawn here for its deep religious meaning. See stunning landscapes… vast mountain slopes, snow-capped peaks ,foot of Everest and the highest saltwater lake in the world! Explore the captivating Barkhor District, a traditional shopping center where Tibetan culture, economy, religion and arts assemble. Meet and dine with a local Tibetan family. Join us in unforgettable travel as we embark on a dream journey to Tibet. Day 1 | Hometown - Beijing Fly to Beijing. Cross the Int’l Date Line. Day 3 | Beijing (B, L, D) Your China tour starts today from Beijing which has served as the capital of five dynasties over a period of 800 years. Start your tour with a visit to Tiananmen Square, the largest public square in the world. Our next stop is the Forbidden City. This complex is the largest and one of the most intact ancient imperial palaces still in existence. In the afternoon explore Beijing’s ancient alleyways also known as “Hutongs” by Pedi cab. In the evening, you’ll enjoy a fabulous Peking Roast Duck dinner. Day 8 | Shigatse - Lhasa (B, L, D) In the morning, we will visit the home of Panchan Lama -Tashilunpo Monastery; you can see the well preserved largest statue of Jampa (future god) in the world. 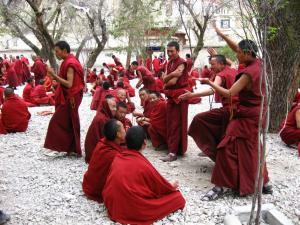 The monastery itself is abiding place for the successive Penchen LamasThen. 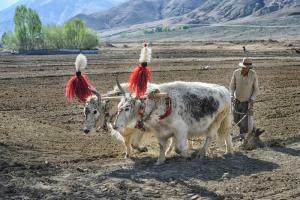 Then we are expected to follow Yalong Valley back to Lhasa, and the guide will get you transferred to your hotels. Day 10 | Lhasa –Shanghai (B, L, D) Fly to Shanghai in the afternoon. Your city tour starts by walking along the famous Bund, a mile-long stretch along the Huangpu River. Lined by the colonial architectures of European design, this area is the best place to capture the western influences of the old days. Day 11 | Shanghai (B, L, D) After breakfast visit the Ming Dynasty Yuyuan Garden which is considered to be one of the four greatest Chinese gardens. In afternoon, we’ll have a tour to the Hengshan Road, a former French Concession Area and now a street with unique Shanghai Shi Ku Men architecture and vibrant night life district. Our final stop will be the bustling shopping district, Nanjing Road. This evening, you’ll enjoy an exciting Chinese Acrobatic Show after dinner. Hotel in Shanghai: Minya Hotel Shanghai (2 nights). Day 12 | Shanghai Chicago (B) Breakfast at hotel. Pack and checkout your hotel. Transfer to the Capital Intl’ airport and fly back home. 1. International Air tickets: 1) for departure from Chicago, IL to Beijing and return from Shanghai, coach class, all tax and fuel surcharges included. Airfare is based on current airline promotion and seats availabilities. Seats are non-upgradeable. For business class or upgradeable airfares, please check with us separately. 2. Land Portion Tour Cost Includes: 1) Ten (10) nights local 4 star hotel accommodations for itinerary above and are all based on double occupancy (twin-share basis); Three (3) persons occupancy in one hotel room can be arranged by adding one extra bed in the room. No hotel room cost deductions for triple occupancies. 2) Most of meals as listed above. Meals per day or as indicated; Chinese-American Buffet Breakfasts at hotel restaurant every day; Lunch or Dinner are basically Chinese Style and will be arranged in local restaurants designated by China National Tourist Beau. American Style fast foods lunch and dinner such as McDonalds, Pizza Huts and KFC can also be arranged per requests without extra charges. 3) Admissions to all sightseeing and culture programs above; 4) Land transportation for itinerary listed above. Coach class air ticket from Beijing to Shanghai. 5) English Speaking Local tour guide for arrival and departure transfer, sightseeing and culture Exploration time. 6) Travel Accident Insurance in mainland China with coverage up to RMB200, 000.00; Travel agency USD 1 Million Liability Insurance. 7) Unlimited Bottled water during sightseeing. Land Portion Tour Cost DOES NOT Include: 1) All personal related expenses, such as phone bills, laundry, Postage, baggage over-weight charge, beverages etc. ; 2) Gratuities for local tour guide, coach driver and national tour guide. US$10 per day per tour member is recommended; 3) China Visa Application Fee [MAG VACATIONS can take care of it at $160 for individual Visa for standard service]. Detailed instructions will be provided after tour confirmations. 4) All expenses not mentioned.